Definition at line 156 of file llaudiodecodemgr.cpp. Definition at line 105 of file llaudiodecodemgr.cpp. References LLVFile::getLastBytesRead(), LLVFile::read(), and S32. Definition at line 120 of file llaudiodecodemgr.cpp. References LLVFile::getSize(), llendl, llerrs, S32, S32_MAX, and LLVFile::seek(). Definition at line 163 of file llaudiodecodemgr.cpp. Definition at line 50 of file llaudiodecodemgr.cpp. 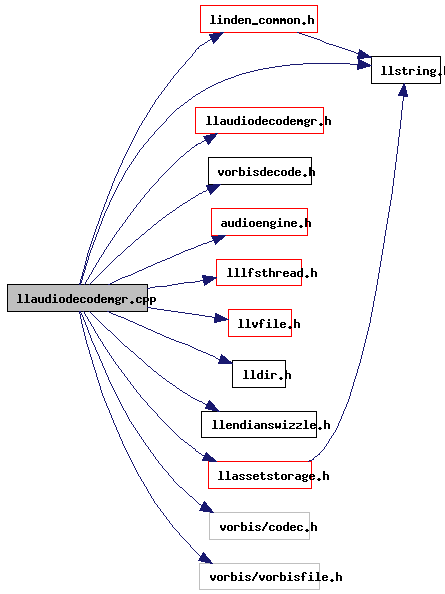 Referenced by LLAudioEngine::assetCallback(), LLAudioEngine::idle(), LLAudioEngine::init(), LLAudioEngine::preloadSound(), LLAudioEngine::shutdown(), and LLAudioEngine::updateBufferForData(). Definition at line 50 of file audioengine.cpp. Definition at line 52 of file llaudiodecodemgr.cpp. Referenced by LLVorbisDecodeState::finishDecode(), and LLVorbisDecodeState::initDecode().